I can't believe it has been so long since my last post... I really got wrapped up in the summertime! I was lucky enough to travel a couple weeks in Ecuador and make many trips around the country to see family and friends. I picked up some assessments for the country and did plenty of nanny and private speech work to keep me busy as well. One of the best things I did was sign up for a curriculum planning course through Dominican. I was able to design tons of new materials and make a dent in my massive reading list - And get compensated with graduate credit! They're not paying me to say this, but I highly recommend this course to anyone working in education. 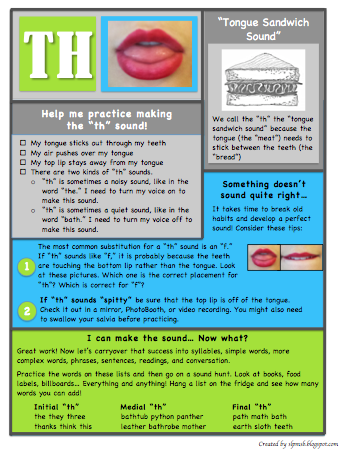 One of the projects I worked on was creating articulation handouts to include in my students' homework folders. These were inspired by some awesome work by bloggers at Heard In Speech and Country Speech Chick. Both of them have designed great resources, but I wanted a redesign using my own language. I think parents always want to help, but we forget that they don't always know how to help! Hopefully these handouts will answer some questions and enhance the amount/quality of carryover practice at home. 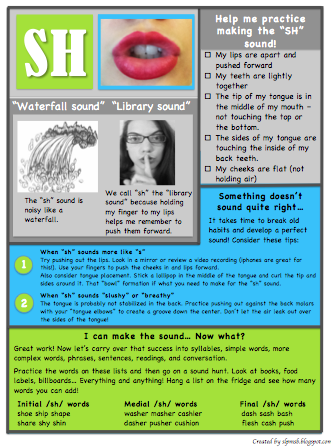 You can find handouts the /th/ and /sh/ handouts in a "later sounds" bundle available on my TpT store for $4.00 or within the complete bundle for $10.00. I made the decision to charge for many of my materials due to the considerable amount of time spent designing custom art and creating them. However, please send me an email (speechlanguagecity@gmail.com) if cost is prohibitive - if you are unable to pay and I will work something out. More to come soon! Please drop a comment if you download - Comments and upgrades are always welcome! I too took that course from Dominican. Isn't it a great way to keep motivated to work on our great ideas and plans during those wonderful weeks off? Your project looks pretty awesome! These are great! I will definitely come back. THese are fabulous! What a great idea...thank you for sharing! Can't wait to see what else you create!! Great resource! I will definitely be using this! I am a first-year graduate student and downloaded them. Thank you SO much! I hadn't heard the sandwich analogy for /th/ and will definitely be using this.